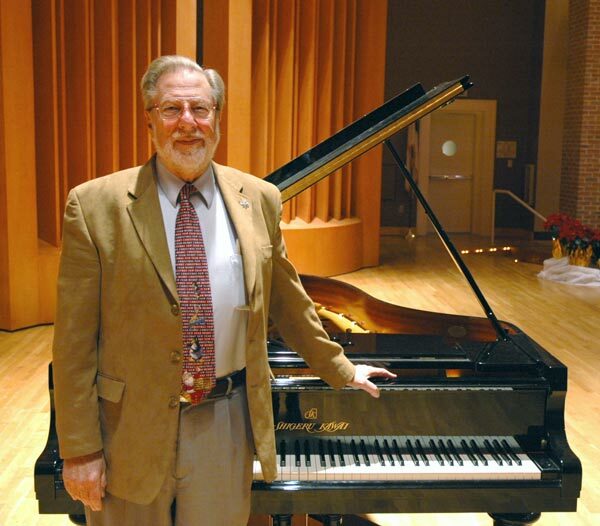 Dr. George Lucktenberg brought with him a Steinway piano and John Lyon harpsichord when he joined Reinhardt more than 20 years ago. Lucktenberg passed away in 2014, and the university has launched a fundraising campaign to acquire the two extraordinary instruments currently housed at the Falany Performing Arts Center. In an effort to continue the legacy that Dr. George Lucktenberg left at Reinhardt University, the School of Performing Arts and the Office of Advancement have teamed up to raise enough money to purchase instruments currently housed at the Falany Performing Arts Center. Lucktenberg, who died in 2014, was an integral part of the university, and Reinhardt wants to do everything possible to keep his memory alive and extend his love of music, according to Dr. Fredrick Tarrant, dean of the School of Performing Arts. Lucktenberg spent more than 60 years in his profession. He served as a faculty member of Converse College for 30 years and spent 52 summers at the Interlochen Arts Camp as a member of its faculty. In 1995, Lucktenberg joined then-Reinhardt College. When he came to Reinhardt more than 20 years ago, he brought with him an extraordinary collection of musical instruments, including the “Toscanini Steinway,” which was featured in the NBC Symphony Orchestra. The Steinway was on the stage of the NBC Symphony Orchestra from 1942-59. It was used by many great pianists and conductors, including Arturo Toscanini, Leopold Stokowski, Arthur Rubinstein, Vladimir Horowitz and Leonard Bernstein. Lucktenberg acquired the piano in 1987. It was moved to Reinhardt in 1997. He said it would be a valuable piece of equipment for the music students, as well as those performing at Falany and those attending performances, to enjoy. The John Lyon Harpsichord was built in 1982 and is a faithful reproduction of a 17th Century instrument. It is a single keyboard with a rich tone that is ideal for the sound and space of the Falany stage. Levels of financial support span from $100 and more to help the university reach its goal. Gifts of $1,000 or more automatically dub the donor a “Lucktenberg Patron,” allowing VIP privileges for special concerts and recitals. Donations are 100 percent tax-deductible, as allowed by law. For more information or to contribute, contact Dean Dr. Fred Tarrant, of the Reinhardt University School of Performing Arts, at fkt@reinhardt.edu or (770) 720-9221. To make a gift of appreciated assets (stocks, bonds, etc.) contact Tim Norton, vice president for Advancement & Marketing, at tan@reinhardt.edu or (770) 720-5545. Give online to the Lucktenberg Instrument Fund at https://www.reinhardt.edu/academics/music/lucktenberg-legacy.html.